From Albany to Albuquerque, from Denver to D.C., Uncle Yo has toured many conventions to perform his unique stand-up comedy aimed exclusively at the geek community. 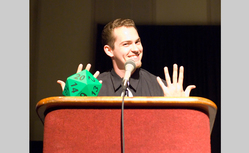 Discussion panel leader, game show host and emcee all-in-one, this Renaissance Nerd keeps the laughs coming and the show rolling. Armed with his giant D20, Uncle Yo celebrates all brands of nerdom: anime, comic books, video games, LARPing, Star Wars, RPG's and manga. He may be One Piece short of a Fullmetal Alchemist, but this Jedi intern promises to "Bebop your Cowboy so hard you'll feel it in your joystick."